Sialic acids are a diverse family of sugar units with a nine-carbon backbone that are typically found attached to the outermost ends of these chains. 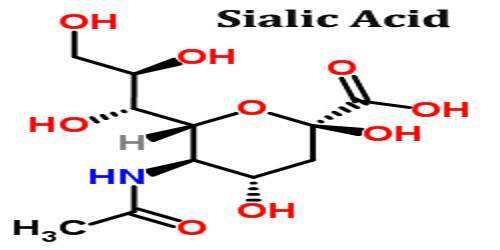 Given their location and ubiquitous distribution, sialic acids can mediate or modulate a wide variety of physiological and pathological processes. In medicine sialic acid is any of a group of amino carbohydrates that are components of mucoproteins and glycoproteins, especially in animal tissue and blood cells. The sialic acid-containing sugar chains play a role in functions, such as inter-cellular signal transduction and “receptors (receptor-like functions)” for binding of some substances to cells. For example, the sugar chains are greatly involved in the viral and bacterial infection of cells. It is a generic term for the N- or O-substituted derivatives of neuraminic acid, a monosaccharide with a nine-carbon backbone. 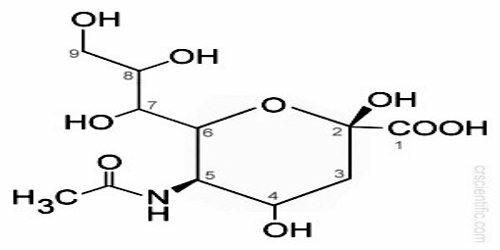 It is also the name for the most common member of this group, N-acetylneuraminic acid (Neu5Ac or NANA). The method for the extraction is mainly from the natural sources of animal origin (swallow’s nests, cow milk, and chicken eggs) or the fermentation method using some sort of bacterial strain of Escherichia coli has been adopted for manufacturing sialic acid, the versatile use of which is expected. The technology of large-scale manufacturing of sialic acid has been established by the original research at SANYO FINE CO., LTD. enabling a large-scale supply. The purity of sialic acid manufactured by this method is higher compared to that obtained by other methods, giving a very high-quality product. Sialic acids comprise a family of about 40 derivatives of the nine-carbon sugar neuraminic acid. The amino group is usually acetylated, leading to N-acetylneuraminic acid (Neu5Ac), the most widespread form of sialic acid. Sialic acids unusually appear free in nature. Normally they can be found as components of oligosaccharide chains of mucins, glycoproteins and glycolipids occupying terminal, nonreducing positions of complex carbohydrates on both external and internal membrane areas where they are very exposed and develop important functions. 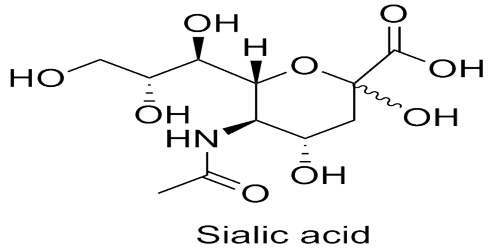 Sialic acids have been found in the animal kingdom, from the echinoderms upwards to humans, whereas there is no hint of their existence in lower animals of the protostomate lineage or in plants. In addition, there are sialic acids in some protozoa, viruses and bacteria. Thus, several strains of Escherichia coli contain long saccharide stretches consisting of up to 200 sialic acid molecules, the so-called colominic acid. Sialoglycoconjugates are present on cell surfaces as well as in intracellular membranes (e.g., of the Golgi apparatus). In higher animals they are also important components of the serum and of mucous substances. The structural diversity of sialic acid is reflected in the variety of its biological functions. Due to its size and the hydrophilic character, along with its negative charge, this sugar can have a simple physicochemical effect on its environment. 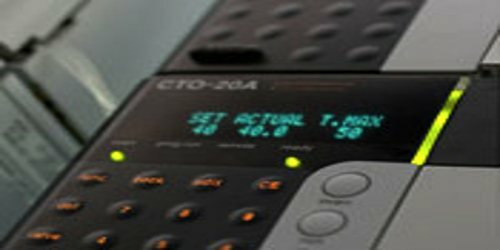 Its main function, however, is that of specific phenomena related to cellular and molecular recognition. Many bacteria also use sialic acid in their biology, although this is usually limited to bacteria that live in association with higher animals (deuterostomes). Other bacteria simply use sialic acid as a good nutrient source, as it contains both carbon and nitrogen and can be converted to fructose-6-phosphate, which can then enter central metabolism. Sialic acid can “hide” mannose antigens on the surface of host cells or bacteria from mannose-binding lectin. This prevents activation of complement.